Brazilian nuts, Latin name Bertholletia excelsa, is a fruit similar in shape to a coconut, which was originally grown in the Amazon. In addition to Brazilian, Colombian, Venezuelan, Peru and Bolivian nuts are available, since these areas have the most favourable climatic conditions in the regions of South America. What makes these nuts known is the fact that these are the richest sources of selenium in the world, and it has been shown that due to its healing properties it can be used as a very effective tool against cancer. Following our article, we will present the facts closer to you and explain how you can use Brazil nuts as a cure at your home, and where you can get one in our region. The trees of nuts fruit are densely distributed in the central and northern parts of South America, making it one of the long-lived species that thrive in tropical rain forests. Brazilian nut tree can grow up to 50 meters in height, developing a broad canopy and thick roots. It is believed that a tree can live about 500 to 700 years, although today because of the harmful effects of human activities their life span is significantly shorter. Each tree bears fruit in the form of pods which has an average of 300 per tree. It has a thick outer layer such as coconut and may weigh up to 2.5 kg. After pollination, it takes little more than a year for pods to ripen and develop fruit. After that, Brazil nuts fall from a tree to the ground, while not falling apart, because of the large layer that protects the nuts from damage. Pod contains 10 to 25 seeds, which are arranged in segments outside conspicuous brown and the inside is white colour. What is its composition and nutritional value? Since this is a very nutritious food item, the first question that arises is whether Brazilian nut contain calories, since it is known that nuts are rich in them. Specifically, 28 grams of Brazilian nut contains about 185 calories, which essentially is not much, considering that the recommended consumption is only a few nuts a day. Therefore the use in moderate and precisely defined quantities is safe even if dieting. Furthermore, these fruits have a significant amount of materials that are essential to our body for correct and better work. In the first place there are proteins which are 17 percent, and natural (good) fats about 70 percent, which results in, as we have already said, a slightly higher amount of calories. Therefore, we conclude that it comes to foods that give energy to our body and matter is efficiently transported through the body and spent, thereby giving us the necessary vitality. Probably the most useful feature of the high concentration of good fats in this fruit is that Brazilian nuts successfully fight against cholesterol, increasing good cholesterol and regulating its levels in the blood. When we talk about vitamins, the most present is vitamin E, which has about 8 mg per 100 grams. What is important to note due to this fact Brazilian nuts as a drug can be used against free radicals, because it is a powerful antioxidant that eliminates all harmful substances and toxins from our body. If insufficiency of minerals such as copper, magnesium, manganese, potassium and calcium appear, do not use synthetic and artificial sources. The most ideal natural remedy is Brazilian nut, which, in addition to all the above elements contains valuable iron and zinc. Often, a combination of manganese, zinc and copper is recommended for people who feel the problems related to sexual impotence. If this is the case, we recommend that you use Brazilian nuts for potency that is highly effective in solving this problem. People who have problems caused by acute or chronic celiac disease can be relieved, because Brazilian nuts do not contain gluten. You can add these nuts to gluten free meals to provide a nice and pleasant taste, and give your body much needed nutrients and help with digestion. What makes these foods famous is that scientists were investigating whether Brazilian nuts contain selenium and they made a substantial breakthroughs in this regard. In fact, considering that today they are regularly used by the Amazon Indians and the peoples of South America, it was concluded that this nut contains selenium than any other neighbouring plant. Speaking in numbers, we come to the startling conclusion that 100 grams of nuts provides even 3485 percent of the recommended daily intake of selenium! With that in mind, you should know that this mineral is an important factor when fighting cancer. Only 1 or 2 Brazilian nuts a day will give you unnecessary amounts of selenium, which will help you when it comes to problems with liver cirrhosis and coronary artery disease. Also, you can use it if you want to have beautiful and healthy teeth. High concentrations of phosphorus will give whiteness, and gums will in a natural way look healthier and get rid of the problems with bleeding and periodontal disease. In addition, it solves the annoying white spots on the nails, which are a major sign that you lack vitamin B. Since Brazilian nuts contain enough thiamine, it very quickly regenerates your nails giving them a natural shine and strength. Although it contains a lot of calories, this nut is rich in large amounts of vitamins, antioxidants and minerals. Brazilian nuts in fact represent one of the best sources of energy on the planet, as evidenced by the fact that it is still in daily use by the Amazon Indians. Some of the most memorable and the most important medicinal properties of Brazilian nuts is the fact that they help digestion, improve heart health and overall cardiovascular system. In addition, it was established that they allow the maintenance of the balance of thyroid hormones, improve immunity, reduce the risk of illness from cancer and help regenerate the skin and remove the signs of aging. Thanks to its high content of healthy unsaturated fats, omega-3 fatty acids and oleic acid, Brazilian nuts for the heart are a natural cure when it comes to maintaining the level of cholesterol in the blood. Interestingly, the consumption of these foods improves overall heart health, primarily because it effectively eliminates omega-6 fatty acids from the body and blood vessels. This allows the prevention of atherosclerosis, heart attack and stroke. Since it comes to food with significant amounts of magnesium in it, Brazilian nuts are used when needed to help muscles to function properly, as it helps produce proteins, the absorption of energy from food and their degradation in the body, primarily in muscle. With that in mind, it is often used by athletes, because in addition it helps to maintain bone strength and regenerate tendon and connective tissue, which is advised in the treatment of sports injuries. Despite the wide range of health benefits, certain precautions are required. As you do not need to exaggerate with other things, so is the case with this food. First of all, it is necessary to consult with your doctor, because it was found that people who already suffer from severe heart disease should be on the alert when it comes to the use of Brazilian nuts, because excessive consumption can lead to increased levels of fat in the body. Therefore, its use is recommended as a prevention and treatment of some diseases. It is therefore advisable to consume one or two Brazilian nuts a day. This will bring an adequate amount of nutrients and minerals that will give your body enough vitality and energy that you spend during the day. Excessive amounts can cause dizziness, nausea and vomiting, hair loss, and allergic reactions. It is recommended to consult with a physician if you have an intolerance to some of the materials that are found in Brazilian nuts. Can pregnant women consume it? You can use Brazilian nuts in pregnancy, as this will bring much-needed protein and selenium, which is contained in small quantities in other foods. Also, we advise you to pay attention to the amount, as the most optimal quantity is one to two nuts a day. Excessive use of these foods can lead to a disorder called selenosis or increased amounts of selenium in the body. 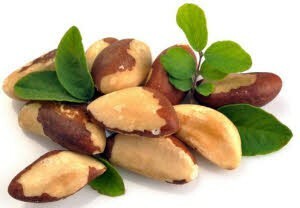 Therefore, if you decide to eat Brazil nuts in pregnancy, strictly stick to the instructions given by your doctor. I used a variety of tablets to improve my potency that were advertised on TV, but they are not particularly helpful. I learned over the Internet that you can use Brazilian nuts for potency, so I combine it with honey and I can say that I am very satisfied. - Dean, 42 years. I regularly suffered from a lack of B vitamins. Nails were weak, breaking, white spots occurred, which I never managed to hide nor to get rid of. As I heard from a friend that Brazilian nuts as a cure for nail assists in solving problems that I had, I decided to try it. In just two weeks, my nails completely changed, became hard, shiny and did not have white spots. - Bran, 28 years. Sometimes I use it as an addition to cakes, primarily as part of baklava. It is very tasty, ideally combined with chocolate, hazelnuts and walnuts. My kids just love it! - Alexandra, 39 years old. If you have decided to get rid of excess weight, while not ruining your health with rigorous diets that are often inefficient, we recommend using the proper diet and use Brazilian nuts for weight loss. The concentration of fibre, nutrients protein and complex carbohydrates in the fruit will help you regulate your digestion and speed up the digestion of ingested food. In addition, they can serve as an ideal replacement for snacks, especially when you feel hungry late at night, because only 2 or 3 nuts can give you a feeling of satiety. These nuts can be eaten alone, fresh, roasted, salted or sweetened, as it combines perfectly and is very tasty. What makes it special is that it can be used as an integral part of many dishes. This time, we will give you the recipe with Brazilian nuts and hazelnuts. Brazilian nuts and hazelnuts grind in a blender and mix with sugar and margarine until combined in the mixture. Turn the oven to 200 degrees to warm it up. Then grease the baking sheet, pour the batter into it and put it to bake for about 10 minutes until brown. Then remove to cool. In an ovenproof dish, pour the milk and add the gelatine, and leave it for about 5 minutes. Take half of the planned amount of sugar for the filling, use two egg yolks, vanilla sugar and add the chocolate. Place the ovenproof dish on a low flame and stir until the gelatine and chocolate melt. Then remove from heat, stir a little and let it cool to room temperature and then refrigerate for about an hour until it completely thickens. In a separate bowl, add the cream and mix it until it thickens. In another bowl, whip the egg whites that you divided from egg yolks, and whisk with a mixer until there is a solid cream. Mix the whipped cream and add the other half of sugar. Chocolate mixture, remove from the refrigerator and pour it on the crust, and decorate the top of tasty pies. If desired, you can top that with a little hazelnut and Brazilian nuts. If you are interested in the Brazilian nut price is around 5 dollars for 100 grams, or a little less than 20 dollars for 1 kg. It is available in all health food stores. These foods are usually sold as raw, in the form of grains with salt. You can find it also in better supermarkets, where you need to be sure to pay attention to the expiration date, and whether there are nuts which are slightly shrivelled, as they can act on the development of mould and thus ruin other nuts - make sure of this. Since it comes to nuts, which contain valuable polyunsaturated fats, they are subject to deterioration if not kept in proper conditions. We recommend that you keep them in a cool, dry place, preferably in the refrigerator to maintain its freshness and all nutritional values. If you follow this advice, remember the universal message - Brazilian nuts keep your health!